Boy do I love a simple, flavorful big bowl of pasta! 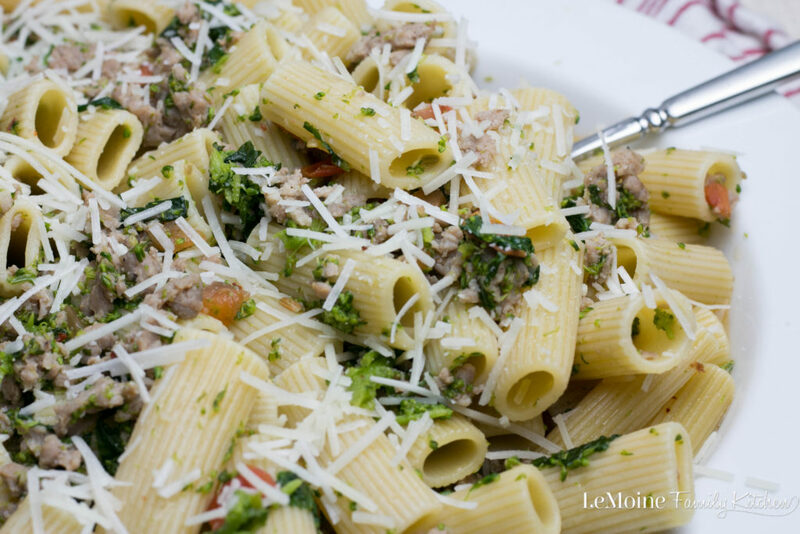 The combination of ingredients in this dish happen to be a favorite of mine… sweet Italian sausage and broccoli rabe is a classic. This recipe is INCREDIBLE but not mine. Today I’m sharing with you this recipe from my amazing blogging friend Michelle’s blog, A Dish of Daily Life. She recently had a pretty scary surgery and is taking much needed time to recover. Some blogger friends and I are sharing some her recipes to help her out. 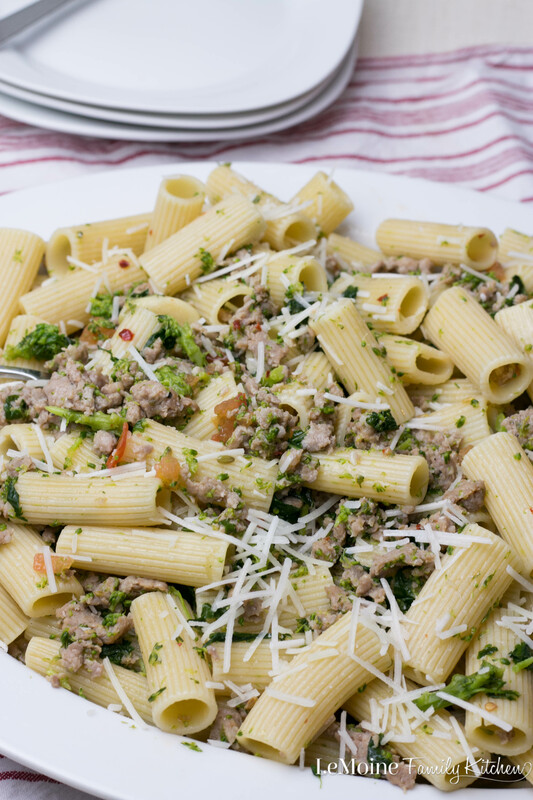 While browsing through her site, which is amazing by the way, I was drawn immediately to this Rigatoni with Sausage & Broccoli Rabe. I have a deep love for Italian cooking and knew this was a dish my husband and I would really enjoy. Its hearty and so full of flavor. The dish comes together really easily which makes it perfect for those busy days. Serve along with a side salad and you are set! Michelle used ground sausage in her recipe, I happened to have links on hand so I just went ahead and removed the meat from the casing. This dish gets its rich flavor because each ingredient gets proper attention. The sausage is first browned then removed from the pan. The garlic and crushed pepper is cooked in that same oil. Toss in a fresh tomato, blanched broccoli rabe the the sausage goes back into the pan. 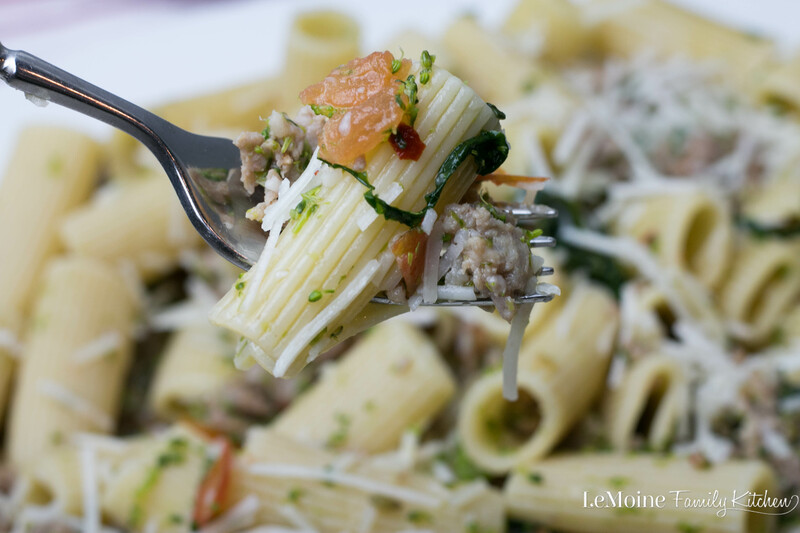 All tossed with perfectly al dente rigatoni and freshly grated pecorino romano cheese. This dish is perfection! Bring 6 quarts of water to a boil and add 2 tablespoons of salt. Drop in pasta and cook according to package directions until al dente. Drain and set aside, reserving ½ cup of pasta water. In a large skillet, heat 2 tablespoons of the oil set over high heat. Place the sausage in the pan and cook for 4-5 minutes. Remove sausage and set aside on paper towel-lined dish. Bring 6 quarts of water to a boil in the pot used for the pasta. Cut florets off the broccoli rabe head and drop into the boiling water for 1-2 minutes with 2 tablespoons of salt. Transfer florets to bowl of ice water and once ice melts, drain and set aside. Heat 3 tablespoons olive oil in sauté pan until hot. Add the crushed garlic cloves and sauté until golden brown, then add chili flakes, sausage, broccoli rabe and tomatoes. Saute and toss for 2-3 minutes. Add pasta to the pan with the parmesan cheese, half of the reserved pasta water, salt and pepper. Toss for 1-2 minutes until ingredients are integrated. If pasta seems dry, add more of the pasta water as needed. Be sure to check out A Dish of Daily Life! Here are some of Michelle’s delicious recipes cooked up and shared by fellow bloggers..
Yum! I love rigatoni! I could eat some form of pasta every night, hah. This is getting pinned to try. Oh you’ll love this one! Super tasty!!! I’m with you, pasta is the best!